Anyone who has ever read George R.R. Martin’s series A Song of Ice and Fire or watched HBO’s Game of Thrones will instantly recognize the works of House Stark. Winter is coming. But these words were meant as more than a warning. They are a constant reminder that we must be prepared for what’s ahead. According to climate experts at the National Oceanic and Atmospheric Administration and the Farmer’s Almanac, Maryland is in for yet another harsh winter. The primary culprit: the polar vortex. And guess what is heading our way? So, in the words of Ned Stark, “Winter is coming.” It is time to prepare your home for what’s ahead. If you have a wood fence, fall is the perfect time to clean, repair, and stain your fence so it can stand the rigors of winter here in Maryland. We know. Ain’t nobody got time for that. So maybe it is time to consider a new type of fencing. Maybe it’s time to consider installing a Vinyl Fence. When it comes to vinyl fencing Mid-Atlantic Deck and Fence Co., Inc. is your best choice! 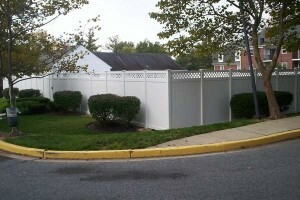 We are one of Maryland’s only manufacturers and installers of vinyl fencing. Please take a few moments to view our vinyl fence gallery. Our commitment to quality and to our customers assures you that you get the best quality vinyl fence on the market today. Click Here to request an estimate today! Vinyl is nearly five times as strong as wood. Vinyl does not decompose like wood and will not rust like metal. This means your new vinyl fence is built to last. This is especially nice in areas with extreme weather, like Maryland (sometimes). A vinyl fence should last you a lifetime. Unlike your old wood fence, vinyl requires very little maintenance. No painting or staining here. A simple cleaning from time to time will suffice. If you have any questions about Vinyl Fence Installation in Maryland, please contact Mid Atlantic Deck & Fence (MAD Fence) today by clicking here or calling 1-800-833-9310. We proudly serve Anne Arundel, Baltimore, Howard, Montgomery and surrounding counties. You can also follow us on Facebook and Twitter as well.